Nikhil Nanda, managing director of Escorts, was pleasantly surprised early this month when an employee walked up to him on the shop floor to talk about the performance of the company’s stock. A series of block deals has taken the Escorts stock to a high of Rs 528, up four times from Rs 130 in March last year. In the last one month, the stock has rallied over 26 per cent. 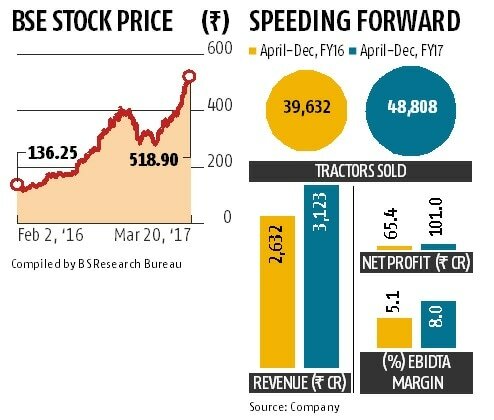 The Faridabad-headquartered company is on an upswing; tractor sales have grown by 23 per cent in in 2016-17, higher than the industry’s 17 per cent, and profit has surged over 54 per cent to Rs 101 crore in the previous three quarters. Revenue is up 19 per cent to Rs 3,123 crore. Brokerages have revised their target price for Escorts and almost every analyst tracking the stock is issuing a “Buy” or “Hold” call. Tractor sales bring in 80 per cent of Escorts’ revenue and the rest comes from construction equipment and the railway division. “It has been a positive year for the industry after a couple of stressful years. We were aggressively planning our product portfolio and had optimised costs. 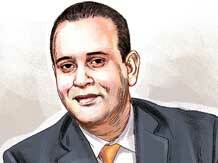 When the industry picked up, there was a convergence,” Nanda told Business Standard. Credit rating agencies like ICRA have upgraded Escorts. The company has improved its debt-equity ratio. Yet Nanda is not satisfied. “Escorts traditionally has been strong in the north and centre. We want to be a pan-India player. We are confident we will be able to make inroads in the south, west and east,” he said. In some pockets of south India, Escorts has managed to increase its market share into the double digits. Escorts competes with Mahindra & Mahindra, Sonalika and John Deere among others in the tractor business. Nanda said the market growth strategy was not about placing products and offering discounts. Escorts develops tractors suitable for soil requirements of a region. Successful inroads in new markets could drive the company’s national market share above the current 11 per cent. “We are at an inflection point and Escorts will get its rightful share,” added Nanda. The company is anticipating another strong demand season from June. Nanda said the company would focus on three verticals: tractors, construction equipment and railways. The tractors and railway divisions are making money, the construction segment, accounting for 13 per cent of revenue, is bleeding. “The construction division was bleeding but we hope to break even at the EBIDTA level in the next quarter. The worst is behind us. We are coming out with new products and the industry is looking up,” Nanda added.